Centrum Wiskunde & Informatica: Representing and Querying Multi-dimensional Markup for Question Answering. 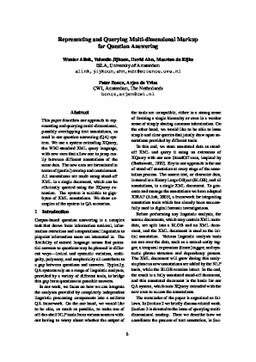 This paper describes our approach to representing and querying multi-dimensional, possibly overlapping text annotations, as used in our question answering (QA) system. We use a system extending XQuery, the W3C-standard XML query language, with new axes that allow one to jump easily between different annotations of the same data. The new axes are formulated in terms of (partial) overlap and containment. All annotations are made using stand-off XML in a single document, which can be efficiently queried using the XQuery extension. The system is scalable to gigabytes of XML annotations. We show examples of the system in QA scenarios. Alink, W, Jijkoun, V, Ahn, D, de Rijke, M, Boncz, P.A, & de Vries, A.P. (2006). Representing and Querying Multi-dimensional Markup for Question Answering. In Proceedings of Workshop on NLP and XML 2006 (5).